I watched him die 15 years ago, and I still talk to him sometimes. I talked to him a lot in the weeks after he was killed and thought maybe I was going a little crazy. And then I thought, it’s probably normal to go a little crazy when you see somebody killed 10 feet in front of you, somebody you knew really well and cared about and tried so hard to save. I’m talking about my client, Quentin Jones, who was executed at 2 a.m. on August 22, 2003. Quentin was 18, homeless, and addicted to drugs in 1987, when he robbed a convenience store with an Uzi 9mm pistol. The store camera caught most of the crime on tape. You can’t see Quentin shooting Edward Peebles, who had stopped in for coffee after playing music with his friends, but you can hear it. Like Quentin, Peebles had a young daughter. During Quentin’s capital sentencing hearing, the two toddlers played together in the back of the courtroom. At the execution, Peebles’ daughter sat behind me, softly crying. Her grandfather, Peebles’ father, sat next to me in a three-piece, blue-striped suit. We were so tightly packed in our row of plastic chairs that his left leg was firmly pressed against my right. On my other side were Quentin’s uncle and younger brother. While Quentin lay on the gurney waiting to be poisoned, his brother signed to him. As children, they’d learned sign language because they had a cousin who couldn’t hear. Quentin mouthed his love for us and an apology to Peebles’ family. This wasn’t new. Quentin confessed and pled guilty. He told the police and the jury he was sorry. In my meetings with him, he frequently and consistently expressed his regret and sorrow for the deep pain he’d caused the Peebles family. He never tried to evade responsibility for what he did. Quentin also had extraordinary insight about his life and compassion for those who failed him: a mother who struggled with drug addiction and a father who faced his own demons, cycling from homelessness to more than a dozen involuntary commitments at Dorothea Dix hospital. Quentin was the oldest son and, to help his family, he turned to the crack-infested streets of Baltimore, joined a gang, and entered the drug trade. Despite a diagnosis of PTSD rooted in his experience of childhood trauma, Quentin grew up during 16 years on death row. He never finished high school, but in prison he read and studied. Quentin had a quick mind and he was thoughtful. He wrote poetry and embraced spirituality, becoming a devout Muslim. He maintained relationships with his family, despite distance and poverty that made it difficult for them to visit. He was a supportive and bright light in the life of his pen pal, an English woman raising a child with autism. A psychologist was so touched by his work with Quentin that he came to the prison the day of the execution to say goodbye, and ended up staying through to the bitter end. Every lawyer who ever represented Quentin urged the governor to commute the death sentence. Over the nine years I represented Quentin, I came to know his family, and they were at the prison all day and into the night of the execution. On that terrible day, the worst moment was telling Quentin’s family that the governor had denied clemency, there was nothing left, their son and brother would be killed in 90 minutes. His younger sister let out a howl that I can still hear now. She sounded like an animal dying in a trap. A social worker and I then went to give Quentin the news. When we told him, and started sobbing, he gathered us into his arms and comforted us. Quentin was so much more than the worst thing he’d done. I often wondered, as I have with other clients, what he might have accomplished if someone had taken the time to see his potential as a child and to rescue him from the violence that surrounded him. In the face of horrible crimes, we often ask, how could someone do this? After defending men and women facing the death penalty for close to three decades, I can tell you how: Allow children to grow up in poverty, incarcerate their fathers, deprive their mothers of mental health care and drug treatment, confine them in dangerous and violent neighborhoods, send them to underfunded and overcrowded schools, and permit school suspensions and juvenile arrests to limit their opportunities. In the weeks after the execution, I thought of little else. I painstakingly retraced and second-guessed every decision I’d made in Quentin’s case. I talked to him while walking my dog. I wished so much then and still wish now that I’d been able to convey Quentin’s humanity to the judges who ruled in his case and the governor who decided against commutation. Perhaps they, and the jurors who sentenced Quentin to death, thought they were rooting out evil, teaching a lesson, meting out justice. What I saw was another killing that perpetuated a cycle of violence and trauma that continues to play out in many lives, including mine. Gretchen M. Engel is the executive director of the Center for Death Penalty Litigation and has represented death row prisoners for more than 25 years. 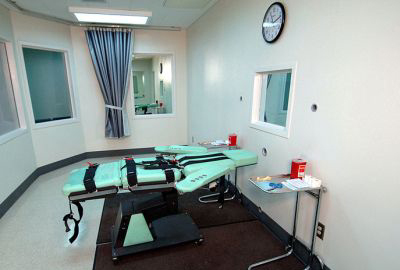 This essay appeared originally on the NC Coalition for Alternatives to the Death Penalty blog.